KS458 LEVI STRAUSS / LEVI'S Red Tab strong rugged shirt size XL, excellent cond! KS410 BEN SHERMAN lined check shirt size 4XL (more like 2XL), excellent cond! leodrums has no other items for sale. 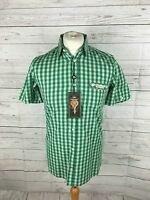 Details about KS269 ONE TRUE SAXON shirt size XL excellent cond! KS269 ONE TRUE SAXON shirt size XL excellent cond!